Snapshot of responsibilities: Key user journeys, stakeholder liaison, copy direction, content rationalisation and redesign, responsive design, prototyping, design sprint reviews, specifying interactions. The European Hyponatraemia Network (EHN) required a consolidation of discrete content and websites into a one stop portal. Existing content included meeting planner and diary, research profiles and outcomes, case studies and professional learning modules. The new features required were peer to peer messaging, forums and user account pages. The content and features had to work across all devices. 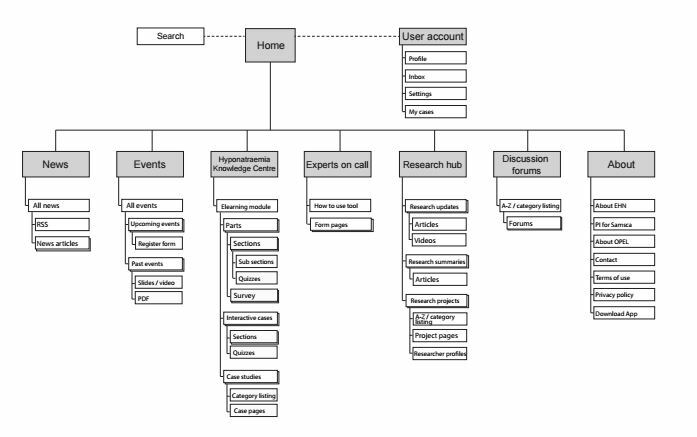 My first task was to rationalise all features into a sitemap (below) to ensure they were all captured on the backlog. Certain features had already been promised to the client by the first rollout date. Herein lay the challenge as the features chosen were random and not aligned to any particular feature set. There had also not been recognition of the administrator interfaces that would make these features work. For example, the Ask the Expert feature (a peer to peer review of patient diagnosis) required a workflow system to display multiple responses, track the review request (24 hours max) and publish the peers’ collected review. I started by putting the jigsaw pieces together in a user journey, capturing all features. This helped me explain to the business that one feature could not exist without another. Scope and order of feature rollout was amended after this step. Once the rollout was confirmed I began to work closely with inhouse medical SMEs and editors to understand the content. I revised content and wrote microcopy where necessary to fit the IA. Working quickly I prototyped journeys, screens and interactions in Axure. I established regular updates with the off-site developer, having face to face meetings where I thought necessary, but mostly by phone. I disseminated the link daily to keep stakeholders up to date on work in progress. Status was further reported on at the agency’s established weekly catch ups, at which I was called upon to walk the client through the prototype. Pharma regulatory requirements necessitated each screen of the new product to be signed off before development. I prepared these documents. As a last deliverable I created the interaction specifications to accompany the prototype for the developer. This document broke the wireframed prototype down into features, interactions and user states.